Jesus knew that the Father had put him in complete charge of everything that he came from God and was on his way back to God. So he got up from the supper table, set aside his robe, and put on an apron. Then he poured water into a basin and began to wash the feet of the disciples, drying them with his apron…. After he had finished washing their feet, he took his robe, put it back on, and went back to his place at the table. Then he said, “Do you understand what I have done to you? You address me as ‘Teacher’ and ‘Master,’ and rightly so. That is what I am. So if I, the Master and Teacher, washed your feet, you must now wash each other’s feet. I’ve laid down a pattern for you. What I’ve done, you do. While the Eucharist rightly stands out in brilliant light, there was more going on in the Upper Room than just the special meal. If we are going to engage the spiritual practice of the Eucharist for the sake of others, we need to include the whole scene. 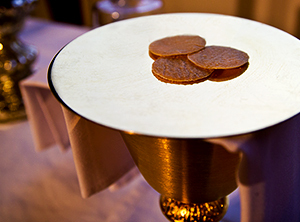 For worship that leads to service, we need the chalice and broken bread and the towel of Jesus. The body and the blood of Jesus represent more than his death on the cross. They signify everything that made his death effectual and worthy as a sacrifice: his matchless life of love, service and obedience to his father. Kids & Youth Christmas Party Does Jesus Reign In My Life?